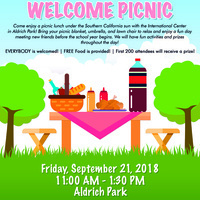 Come enjoy a picnic lunch under the Southern California sun with the International Center in Aldrich Park! Bring your picnic blanket, umbrella, and lawn chair to relax and enjoy a fun day meeting new friends before the school year begins. We will have fun activities and prizes throughout the day! EVERYBODY is welcomed! Follow signage that includes "International Center" on it. Join our big group in the park across from Gateway Study Center/Langson Library. Free Food is provided! First 200 attendees will receive a prize! Canon Printer Support Number :- Some time user may get some sort of issues during installing the Canon Printer. You can use our Canon Customer Care number any ant time for solutions. Kaspersky Customer Support Number :- Kaspersky Customer Support Number Provide Support for Kaspersky installation, Kaspersky Activation & all Kaspersky Technical Support related problem. Bitdefender Support Number :- We provide online technical support Number for Bitdefender Antivirus. Contact Bitdefender Customer Support Number to get instant help for Bitdefender Antivirus. Avg.Com/Retail, AVG Registration Antivirus , If you want to protect your computer world from the invasion of virus, hacker and other suspicious things, then you need to opt the AVG Antivirus software. Contact at AVG Customer care support team to get help on few easy step. Norton NU16 Setup,Norton.Com/nu16 :- Norton Setup is a very time-saving process, and it is faster than other competing software. After installing Norton.com/setup and scan your device for protection. Mcafee.Com/Retailcard - Mcafee.Com/Activate McAfee Retail Card activation at mcafee.com/retailcard, enter your product key for McAfee Activate online. Call for McAfee Technical Support Mcafee.com/activate.